There are 24 Assisted Living Facilities in the Temecula area, with 8 in Temecula and 16 nearby. The average cost of assisted living in Temecula is $3,122 per month. This is lower than the national median of $3,346. Cheaper nearby regions include Fallbrook with an average starting cost of $3,025. To help you with your search, browse the 75 reviews below for assisted living facilities in Temecula. On average, consumers rate assisted living in Temecula 4.5 out of 5 stars. Better rated regions include San Clemente with an average rating of 4.6 out of 5 stars. Caring.com has helped thousands of families find high-quality senior care. To speak with one of our Family Advisors about assisted living options and costs in Temecula, call (855) 863-8283. Temecula is situated among 3,000 acres of scenic wine country in Riverside County, California. It's popular spot for tourists given the numerous events that take place in the city, including the Temecula Valley Balloon & Wine Festival and the Temecula Valley International Film Festival. Seniors make up over 9 percent of the population in Temecula, which is home to eight assisted living facilities. There are 41 more in surrounding communities. At least 75 percent of residents in these facilities are aged 60 or older, and varying degrees of care and supervision are provided. Temecula facilities, which are licensed through the Department of Social Services, Community Care Licensing Division, are officially referred to as Residential Care Facilities for the Elderly (RCFEs). Temecula is a warm, sunny city. It ranks 73 out of 100 on Sperling’s Comfort Index, meaning that the city is generally comfortable year-round. Residents enjoy 276 days of sunshine and just 15 inches of rain annually. July highs are around 93 degrees Fahrenheit, and the average January low is 42 degrees. While Temecula has a high cost of living when compared to the rest of the United States, its overall cost of living is slightly below the state average. Seniors can expect to spend more on groceries, utilities, housing and transportation than they would in other U.S. cities. Temecula has a relatively low crime rate and is statistically one of the safer cities in the United States. On a scale of 1 to 100, with 1 being the safest, the city’s violent crime rate is 24.9 and the property crime rate is 35.0. In both categories, Temecula’s crime rate is below regional, state and national averages. Temecula has a reliable transportation system courtesy of the Riverside Transit Authority. Seniors who cannot walk to a bus stop are eligible for local Dial-A-Ride service within the city and within a three-quarter-mile radius of local fixed-route bus service during normal hours of operation. The Temecula area is home to world-class medical facilities, including Temecula Valley Hospital, in the event of medical emergencies or illness. Temecula has an array of community resources for seniors, including the Office on Aging Senior Surplus Food Distribution, an organization that provides healthy home-delivered meals to homebound seniors in the area, as well as two senior centers. Assisted Living costs in Temecula start around $3,122 per month on average, while the nationwide average cost of assisted living is $4,000 per month, according to the latest figures from Genworth’s Cost of Care Survey. It’s important to note that assisted living rates in Temecula and the surrounding suburbs can vary widely based on factors such as location, the level of care needed, apartment size and the types of amenities offered at each community. 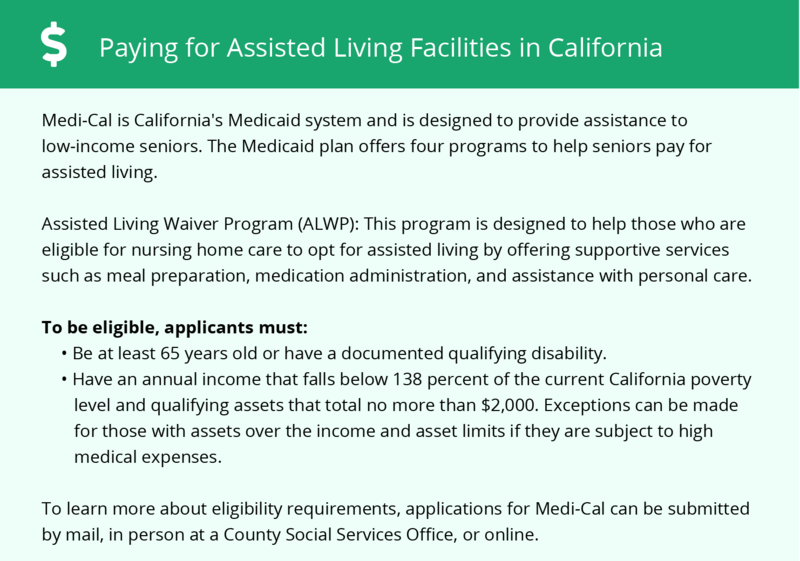 In Temecula, low-income seniors can qualify for financial aid to help pay for the cost of assisted living. 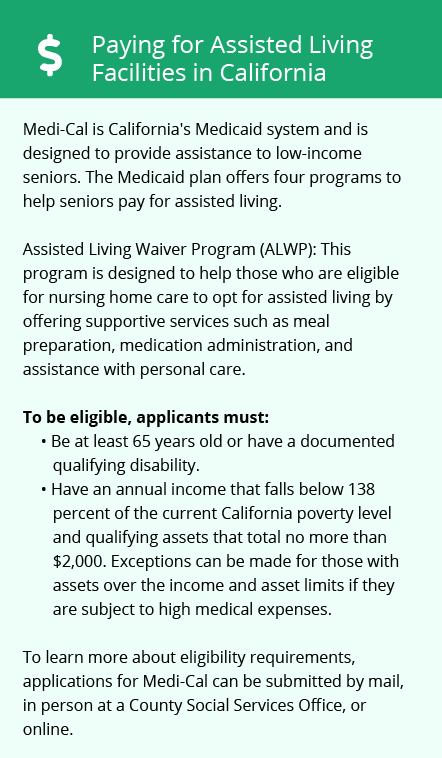 Currently, there are two programs that may help fund assisted living, including Medi-Cal, which offers an Assisted Living Waiver program, and Supplemental Security Income – Category G.
Temecula and the surrounding area are home to numerous government agencies and non-profit organizations offering help for seniors searching for or currently residing in an assisted living community. These organizations can also provide assistance in a number of other eldercare services such as geriatric care management, elder law advice, estate planning, finding home care and health and wellness programs. To see a list of free assisted living resources in Temecula, please visit our Assisted Living in California page. Temecula-area assisted living communities must adhere to the comprehensive set of state laws and regulations that all assisted living communities in California are required to follow. Visit our Assisted Living in California page for more information about these laws.